After years of being locked away I have final got around to knocking the dust of my sewing machine and start using it again!! I thought it was time to start re-styling lots of my old clothes, I no long wear for whatever reason. 2} Backless ~ when do we get that much weather to wear backless top in this country? and means no bra !! Creative Mondays Linky list has now closed. "Flowered Skirt And Neon Pink Shoes …"
Very good idea ! 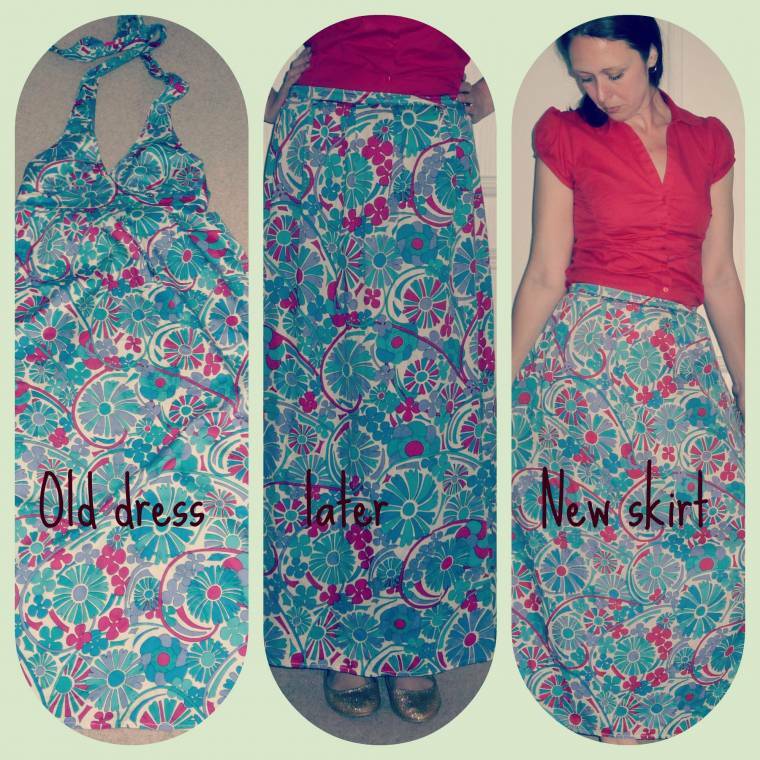 Love the skirt…looking forward to restyles in the future . It came out great, nice redo! Congratulations Claire! It is great that you can sew. I am sorry I did not keep up with my sewing! I think I should take it up again. Beautiful skirt! Love it! I am happy to be co-hosting again. Thanks for hosting, Claire & have a great week…I'll be sending my old dresses your way :o) for when I sew, I sew my sleeves to what ever is going through the machine. I like it a lot better as a skirt, well done! I love your new skirt!! I've been sewing more lately too and I love it! Just remembered some knit pink camo fabric I picked up a few years ago and I think I'm going to make it into a skirt soon!Thanks for hosting a such a great link-up! Great re-fashion! The skirt looks great on you. Thank you for the party! Thank you 🙂 its likwe having something new now ..
PS – love the new look on the blog! It's Great idea! I love it.Thanks Claire for hosting . Love your new skirt!! Great upcycle! Thanks for hosting, hope you have a fabulous week.